The Community edition does not require any access key or listing your web site address on our site. Updates come directly from the WordPress plugins repository weeblrAMP page. Your access key is some sort of a password that is used by weeblrAMP to authorize updates and other services. It is unique to your account. It will be the same for all the software you get from us, even if you renew your subscription. It can be found on your dashboard, under the My account tab. On Multisite setup, you should enter your Access Key on the main site weeblrAMP setting page. The Community edition does not require listing your web site address on our site. Updates come directly from the WordPress plugins repository weeblrAMP page. Depending on your subscription, there might be limits on the number of sites you can use one-click updates and other services (installation and usage, as with all GPL-licensed software cannot and is not limited). Just clicking on the Update now button will update your site to the latest version of weeblrAMP in a few seconds. 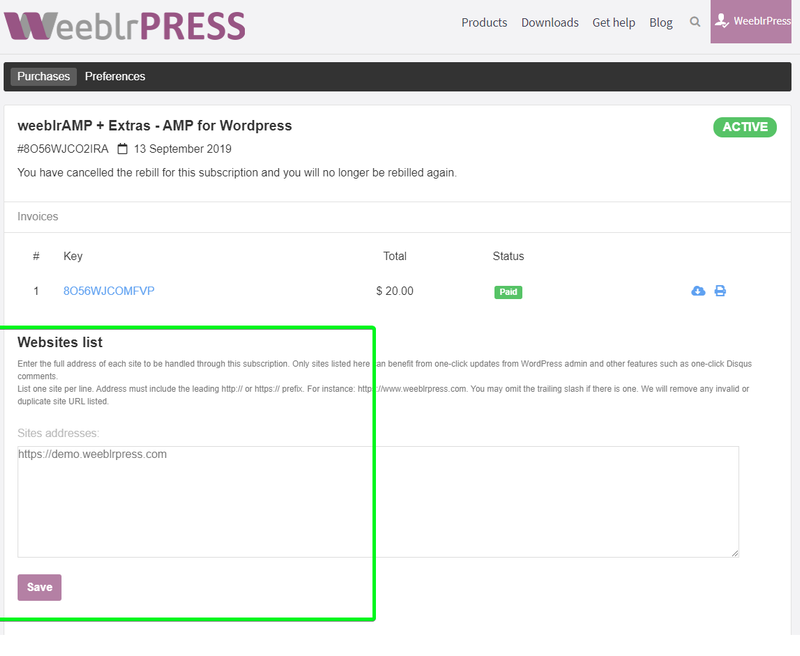 Just as when you installed weeblrAMP initially, you can also download a newer version and install it using the WordPress Plugins page. The Community edition can downloaded directly from the WordPress plugins repository weeblrAMP page. When deleting, and then installing the new version, your weeblrAMP configuration options are entirely preserved.